Mr. McCarthy explained what a State’s attorney is and does. They are the prosecutors for all criminal cases committed within their geographic boundaries, covering juvenile crimes and adult crimes from drunk driving to homicide. Although each jurisdiction may do things a little differently, the audience learned about special units covering child abuse, sexual assaults, and abuse of seniors, and mental health and substance abuse courts and truancy prevention units. Aisha Braveboy, the daughter of Grenadian immigrants, won a seat in the Maryland General Assembly (District 25) and chaired the Legislative Black Caucus before her election as State’s attorney for Prince George’s County. Anne Colt Leitess was the first woman to head a violent crime unit in Baltimore City, prior to being appointed to fulfill an incomplete term as State’s attorney for Anne Arundel County. She since was elected in her own right and is the first woman to hold the job in its 95-year history. Marilyn Mosby is in her second term as State’s attorney for Baltimore City. Her efforts include expanding community outreach, reducing gun violence, and advancing public integrity among the police and officers of the court. Ms. Colt Leitess replied that the public thinks that the attorneys can win cases as brought to them by police when, in fact, that is just the beginning. Ms. Braveboy added that state’s attorneys are not just the top prosecutor; they are the top law enforcement officers with a mandate to keep the public safe. She advocates for restorative justice, and the importance of reintegrating individuals who have offended into the community. Ms. Mosby said that prosecutors are gatekeepers, responsible for justice and safety. She called for efforts to address the roots of crime: poverty, unemployment, and racism are just some of the factors contributing to the cycle of crime. Where there are gaps, she works with the legislators to pass laws to protect the community. The next question was, “What would you most like to change?” Ms. Braveboy said many challenges arise when dealing with juveniles, because the statues offer little flexibility. There are also not enough appropriate diversion programs to get people the help they need to change behaviors. Ms. Colt Leitess pointed out that, in her district of Anne Arundel, there were no after-school sports programs for middle-school aged children. She then asked the audience what they thought those kids would find to do in stead of sports. Mr. McCarthy asked Marilyn Mosby what she loves about her job. She likes being a role model. Unfortunately, she is among the few women in this role since only one percent of prosecutors are women. Anne Colt Leitess responded to the question, “What women’s needs are unmet?” She said that domestic violence is not getting the attention it deserves: it is underfunded and short staffed. There is a lack of advocacy, shelters and options. Judges are reactive, and all should be trained in sensitivity to domestic violence. Ms. Braveboy said that Prince George’s has domestic violence dockets that have been helpful. They have a family justice center, but the resources are just not adequate. “The biggest reason women stay [in abusive situations] is that they have no place to go,” noting the challenge of finding suitable shelter for women with multiple children, or teen-aged male children. Ms. Braveboy is advocating for a taskforce to create housing options and tax incentives. She also called for more help for women raising families alone. Not only can it be difficult to find role models for boys, but also it is difficult to supervise them after school while at the same time working a full-time job. Ms. Mosby said that women need a role in shaping legislation in criminal justice reform. “If you don’t have a seat at the table, you are on the menu,” she said. Her example was the five years it took to change the law to allow prior crimes of serial perpetrators to be admitted as evidence. Ms. Colt Leitess mentioned gaps in the law like surreptitious videoing (“upskirting”), for example. It was important to change the law to the “private area is you” not just a dressing room. Responding to a question about getting buy-in from the people, Ms. Braveboy emphasized that community outreach is crucial. People can be entrenched in bad policies. Criminals come out of jail angry and “better criminals.” Sometimes state’s attorneys have to explain to well-intentioned people who want to ‘get tough on crime’ that passing a law to make a crime a felony, without increasing the penalties, may make it harder to prove and prosecute. We need a vision of better justice. A member asked about two policies on WDC’s advocacy priorities list that failed in the General Assembly. One, to change the law about juveniles being convicted for life without possibility of parole, is moot due to a Supreme Count decision disallowing this punishment for juveniles. The second was a request for a community release and reintegration center focused on women. Maryland has three centers for men and none for women. The support of the States’ Attorneys is important to make this pass. Another audience member wanted to know if the prosecutors were instructed about the immigration consequences of their prosecutions. While Ms. Colt Leitess said that she tries to be blind to that, justice for the victims is primary. However, the number one worry is that victims and witnesses will not report crimes or aid in the cases due to deportation fears. WDC Board member and First Vice President, Diana Edensword Conway, asked the panelists how best WDC could support their visions and missions. Ms. Colt Leitess called for mini-projects. She sees a specific need for more activities for youth. 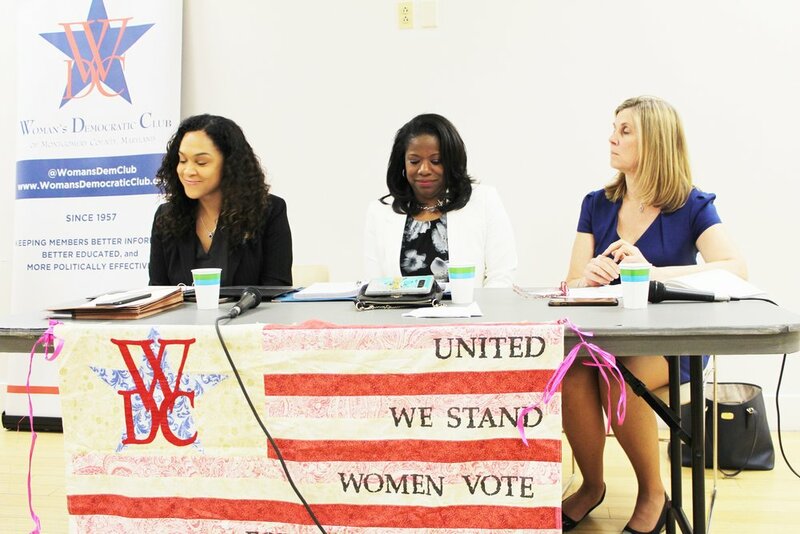 Ms. Mosby said to stay engaged; “local politics is everything.” She encouraged our membership to take risks and run for office, because we need more women in power. Ms. Braveboy suggested specific issue forums: community dialogue with action plans.